Our mission is to improve the quality of life of each and every client. Empowering their lives in areas where they are no longer able to do for themselves. The emphasis is preserving their pride and dignity, self-worth and esteem. Founded by Andria Patricia Harris, The Quilted Shield was created for the sole purpose of providing the very best in home care service for patients living with Dementia and Alzheimer's Disease. 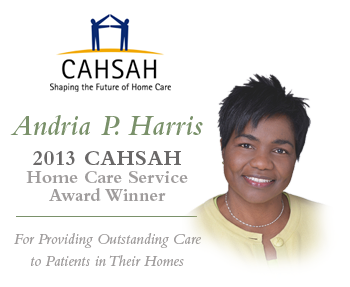 Having excelled in providing superior patient care for more that fifteen years, Ms. Harris was honored as the recipient of the prestigious 2013 CAHSAH Home Care Service Award. During her tenure of service she has witnessed a great need for improvement in the dementia care sector, and has taken this as a personal challenge to improve the quality of care available in Los Angeles County. The staff at The Quilted Shield is trained in all aspects of Dementia care, and screened for the must-have attributes of compassion and care. They are cleared legally and are in compliance with all state laws as they relate to Senior Care. We use training manuals and equipment endorsed by the Alzheimer’s Association and Care and Compliance Group. The Quilted Shield provides residential senior care for anyone who is experiencing any form of dementia, and requires this type of loving care. Therefore our paramount interest is their safety as they live this remaining season of their lives with us. All clients are provided with constant supervision, because we are aware that some symptoms of the disease includes wandering, and we endeavor to protect as we serve our clients. We welcome visiting families, pets and friends — to make each resident's day as beautiful as possible. Whatever we do is done solely for the enrichment of the lives of our clients and residents. While we are currently serving the community one client at a time, our efforts continue in establishing ourselves and learning the essentials of the greatest strategy in opening a very successful Care Home for (Dementia / Alzheimer’s) — in both endeavors our fundamentals and philosophy remain the same.